Many years ago Srila Prabhupada instructed his disciples to mass produce small Gaura Nitai Deities (he called them Happy Dolls) and distribute them on Sankirtan along with his books. He told the devotees that they should include instructions on chanting with the Deities, stating that if they chanted (Pancatattva Mahamantra and Hare Krishna Mahamantra) for the Deities and put some fruit in front of the Deities, then partook of the fruit themselves; they would enjoy great fortune! Since I heard this instruction from His Divine Grace, I have been meditating on how to fulfill his desire. 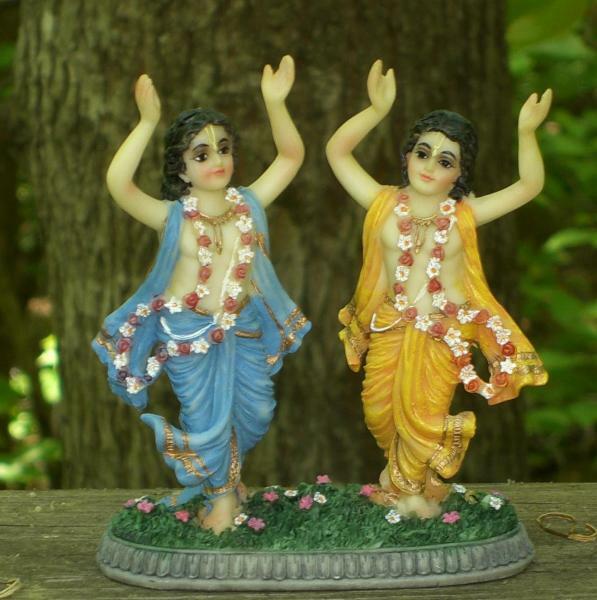 Recently I contacted devotees in China who manufacture small figurines including Gaura Nitai Deities, and arranged for special packaging for street distribution along with good pricing so that temples and individual devotees could afford to distribute these Deities and make some money on them. Just a week ago a large shipment arrived in our warehouse, and they are ready to go out and be distributed. They are in a very attractive package (see accompanying pictures) that will practically guarantee many sales. I only have a limited quantity right now, and plan on ordering much more in the future. Devotees will need to arrange for the insert (how to chant and where to write for more information) for the Deities. I can be contacted at my email address: bkgoswami@earthlink.net for ordering information.